It has been raining so much this month that I am sure the mosquitoes will have a field day this year. 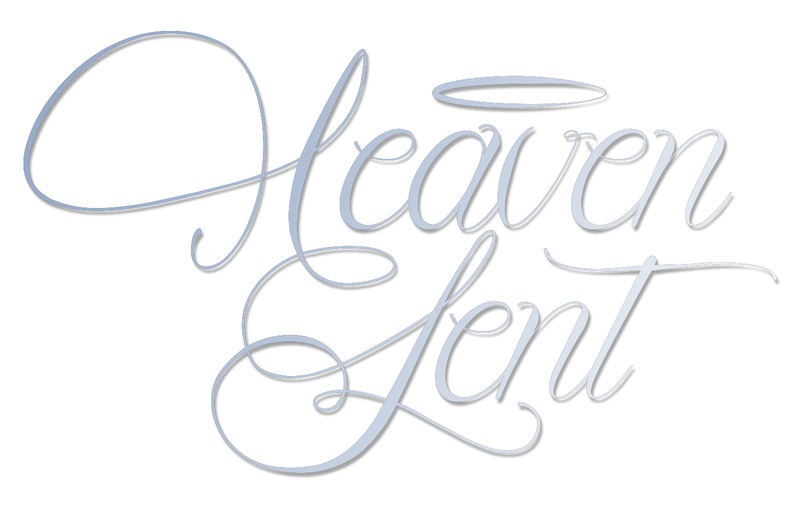 Here is a little topper I designed a few years ago. This was taken off the craftsy site when Craftsy did their purging. Here it is using the beautiful Island Batik Fabrics. Today I put the binding on three quilts. I can only show you one. If you have been reading my post, you will remember that this quilt is made from the scraps of another quilt. I used the Accuquilt Go orange peel die to make the shapes. I also used Aurifil 50 wt. thread. I have yet to quilt the other quilt but it is sandwiched. I love this Oriental fabric from Inchworm Fabrics. I have really made some headway this month in all of the quilts I have an obligation to make. I always worry about meeting deadlines but I think I am going to make it. I have two quilts that need to be quilted (this is not counting the UFO's), yes, I have plenty of those. For several days last week I have been cutting the excess fabric off the back side of my quilt top. It is applique and I cut out the bulk of the fabric. I would show you but it is for Island Batik Fall/Winter catalog. It took me six hours one day and about two the next. Wasn't a fun job but someone had to do it. So Saturday when it was raining and raining outside I decided to do something non sitting down and sewing. Why not cut up some of my Island Batil scraps? So the story begins! Half square triangles using the Accuquilt Go Cutter! You think it would have made a dent in my scraps (this is me shaking my head no). Then that evening and this morning I have been making these flying geese. Now most of you know I love my Accuquilt Go Cutter but the Qube is the best idea since sliced bread. 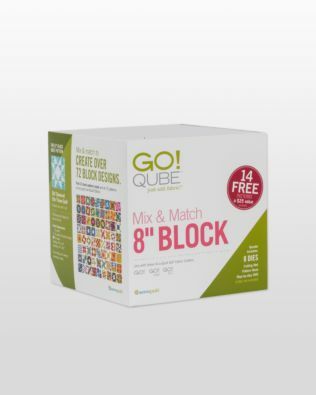 I never thought I would be interested in the Go Qube, I have the 8" but I tell you having the half square triangle on one die is ideal for projects such as these. 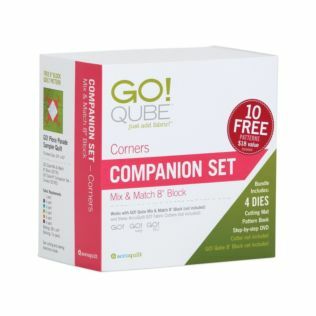 I am not just saying this because this Go Qube was given to me by Accuquilt through Island Batik. I loved it so much that I went and purchased the companion sets. I originally purchased the corners but then Gene Black convinced me to buy the angles as well. What are friends for, right? They get you in trouble every time (smiling). Hummmm stay tune, the light bulb just went off in my head. 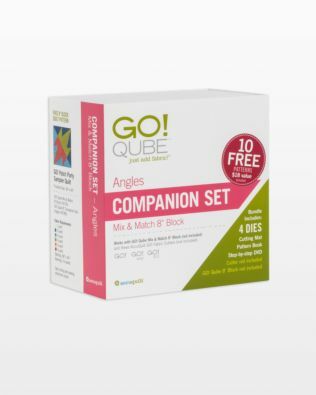 The month of April Island Batik Challenge is to make a square (QUBE) baby quilt using the Accuquilt Go Dies. Look who is playing in my grandson's room and on his bed no less!! Time to take them outside! Mr. Brown Bear has had enough of the photo shoot! Maybe next time I will take a straighter picture??? This is my inspiration for this quilt. I have had this design made up for several years but last year I made it with Island Batik fabrics. I kept thinking that it would make an adorable quilt. I am talking about the hearts that border the runner. I used the 5" stash Builders by Island Batik, just perfect for cutting with the Accuquilt Go cutter! So when I received the Accuquilt Go Qube, I saw that it had the half squares and I have the circle die (which is not shown nor included in the 8" cube) would be perfect to make the hearts. Unfortunately, my circle die grew legs and walked off!! I used the small circle and cut them in half. Here you see the half square triangles with the half circles on top of them. I glued them down just a thin strip across the straight edge, just enough to keep it in place while I was sewing....and as you can see, I did not take the half circle all the way to the raw edge. If you chose to you can just use the whole circle. Anyways, I sewed the half squares together, in this case, ten half squares to a row, 4 rows. White Island Batik foundation fabric for the half squares as you can see in the picture above or on the quilt. A two and a half inch strip x 40 inches long for the half circles to be blanket stitched onto. After sewing the 2 1/2" strip to the half squares and the glued half circles, I flipped up the half circles and then blanket stitched. In this case, I waited until I had the whole quilt top together and just blanket stitched through the top, batting, and backing. I did something I have never done before and that was use my embroidery designs on my sewing machine to quilt this quilt. I used the hearts and the curvy line. Now it is time I go pick up my grandson from Preschool, hope you have an amazing day! There hasn't been much sewing going on around this house lately (poor me). That hasn't stopped me from purchasing stuff..... this is our secret!! I love the wonder clips, the small ones, so I ordered 100 of them. Then I purchased the three light threads off Amazon and then the gray is from Hancock's of Pudcah. I love the Aurifil threads and you see that one by the white, that is my all time favorite thread....EVER!! I am doing another quilt for Fall Market and Island Batik Catalog and so went searching for threads to do some blanket stitching with and yep....I am going to use my FAVORITE COLOR!! Could n't pass up the gray. I am weak, what can I say??? Please don't look at the mess on the table (now saying that you are going to look)....oh well...no excuse except I just don't have the room in this sewing room. I got it last night and cleaned it up, I still need to oil it. I was for certain that the cutter wouldn't work since it hasn't been used in forever but low and behold it does. After I cleaned it up, threaded it...you won't believe this but it runs like a dream. I almost hate to give it back to her. As usual, I am doing what I am not suppose to be doing and not doing what I should be doing! A few weeks ago when I was visiting my mother I saw this wall hanging made of wood on one of the doors. I thought, hummm....that would make a cute wall hanging in fabric. So this morning instead of doing what I should be doing I made this instead. Theirs said Welcome. I used my awesome Island Batik scraps, three different kinds of Aurifil Threads (orange, black, and pink), and then I had just the right size scrap of hobbs batting. Do I love scraps or what? I take my grandson to preschool in the morning and pick him up at 11:30 but today was pizza day so I pick him up at 12:00. So....last night I cleaned so I could have time to sew this morning but as usual, I got side tracked. Our grandson takes a nap after he has his lunch so I was laying down with him. The next thing I know these two eyes are staring at me. He says, Ya Ya....I can't sleep, you are snoring. So I got kicked out of the bed. What was a gal to do? I made headway to my sewing room and finished up my wall hanging. I was rushing to get the binding on before he woke up and well...someone was not paying attention. I put the binding on with the raw edge out...OH my stinking gosh. So I spent my few remaining minutes ripping, ripping, ripping. He was sweet enough to let me finish up before going outside. CHECKING THINGS OFF MY LIST!! You will just have to forgive my pictures today, it has been raining like cats and dogs and now it is stinking cold outside. I have been freezing for two days, under the covers reading books...yes, that is a whine and I would like some cheese with it. This first quilt I have showed you before, it was waiting to be quilted. I quilted it on my Pfaff since I can not get to my longarm, that is not a whine. The fabrics are Paisely Dots by Island Batik. The cancer ribbon design is by craftistitch. I used my white aurifil thread to sew everything together with. I have a huge cone that I am trying desperately to use up....I say desperately because that is all I have been using lately. This next one is just the top, needs to be quilted. If you saw the previous post, you will know that this is scraps from a project I am doing with my sister. Love the oriental fabrics which you can get at Inchworm Fabrics. I used the Accuquilt Go Orange Slice die and pink Aurifil thread. Here is just a sneak peak of my April Quilt for the April Island Batik Challenge. Don't you just love the turquoise aurifil thread? Ummmm Ummmmm good. So, I have two of my eight projects done. I feel good about that but I added one more to the list...ha ha!! Today I am happy to report that I have the quilt top finished. If you saw the post before this, you would know that my sister and I are making the same quilt from the same wonderful fabrics from Inchworm Fabrics. We are using the Quick Curved ruler, here are the scraps from the project. I sewed two half moons together. Then got out my Orange Peel Accuquilt Go die. Before and after the cut. Looks so nice and neat. I decided to blanket stitch them with Pink Aurifil Thread, umm ummm good. Ok, I know what you are thinking, one minute I am overwhelmed and the next I am starting another project. Let the record show that I just needed focus and writing it down helped me do that. When I have things I need to do if I can get a direction I do nothing. Then...I just couldn't let these scraps go to waste and had to do something with them or they would be just that, scraps to be thrown away later. Are my excuses any good? I am going to set up my Pafff so I can quilt the Charity Quilt....and when I get tired of that will work on some Orange peels.